There is something addictive about fishing for smoothhounds. Maybe it is the fact that they are actually members of the shark family that stirs the blood, or simply that once you have caught one, and felt its awesome power first hand, you become hooked for life. The initial run of fish starts as the evenings draw out in April. 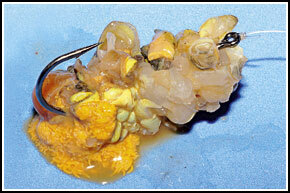 But these are usually tiny specimens and it’s not until the crab peel gets going that the bigger boys move inshore. Then, as summer warms the shallows, the hounds move around the coast and the mothers of all smoothhounds move close to shore to drop their pups. It’s then that the 20lb-plus specimens are landed. Smoothhound fishing is brutal – no shy nibblers, these, they are hit and run merchants with an incredible turn of speed. Even a four-pounder can pull your rod over, while a 6lb fish can catch you out if you haven’t balanced your clutch. Good news is that stocks of smoothhounds are on the increase, they are getting bigger, and a fish that was a rare sight a couple of decades ago can now be caught from many marks around the Britain coastline. Undoubtedly anglers returning this species alive is one of the contributing factors, although the species is considered labour intensive to catch and market for commercial purposes, as well as being unpopular on the fishmonger’s slab. 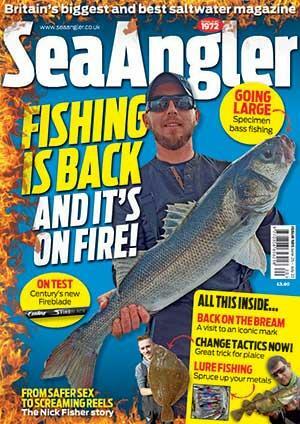 That’s good news for the fish and sea anglers. Let’s not get complacent here. Being caught for fertiliser could be their downfall, as greedy commercials switch to a less profitable species after catching and killing everything else. From south to north, there are many great opportunities Venues are well established, with mixed or clean sand sea beds holding a population of crabs, including hermits, spiders, velvet swimmers, shore crabs and edibles, which hounds love to crunch. The bigger female fish come close to shore to give birth and are hungry before and after this natural cycle, so they are always seeking new sources of food. The fact that the different species of crab are peeling at different times through the spring and into summer prolongs the smoothhound season. There are a growing number of well-known smoothhound venues as the species expands its range northwards. Some offer more hounds than others, some have the bigger ones and even a longer season. ■ Sussex & Hampshire: Selsey West Beach, Bracklesham Bay, Pagham and Hill Head. ■ The Isle of Wight: Burntwood, Hampstead, Fort Victoria and Yarmouth pier. ■ Dorset: South Bournemouth beach, and Chesil beach at Ferrybridge. ■ Devon: North coast through the Bristol Channel, Porlock and Minehead. ■ South Wales: Aberthaw, Marcross, Monknash and Rhoose. ■ Anglesey: Llanddwyn Island and Raven’s Point. ■ Lancashire: Cleveleys and Rossall Point. ■ Cumbria: Nethertown and Braystones for the odd smoothhound. ■ South-west Scotland: Kirkcudbright region for the odd smoothhound. ■ Lincolnshire: Chapel Point, Chapel St Leonards, Moggs Eye and Huttoft. ■ Suffolk: Mundesley and Orford Island. ■ Kent: Sandwich Bay, Reculver and Dover breakwater. Smoothhounds give birth to live young and the two species of hound, the starry (Mustelus asterias) and the common (Mustelus mustelus) do this differently. That’s how it was discovered there were two distinctly different species. Originally it was thought starry were immature commons. The difference is that the starry is ovoviparous, which means the young hounds inside the mother are nourished by the yolk sac only. The common is viviparous, so the eggs not only hatch inside the mother but the young are nourished directly by the mother before they are actually born. ■ Smoothhounds don’t have teeth, just a row of bony plates with which they crush their prey. ■ Picking a smoothhound up by the tail is said to strain its stomach muscles, which are normally supported by the sea. Pick a hound up by its tail and pectoral fin (that's the large one just behind the gills) and support the fish’s tummy with your arm. 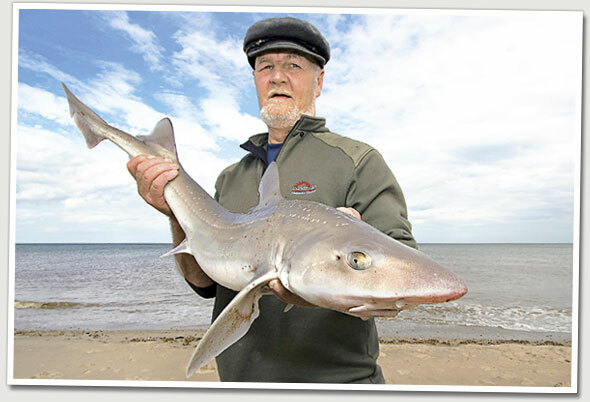 ■ The smoothhound does not have a legal minimum size limit on the Defra list. This is because the hound is not commercially popular. The limit used by sea anglers is usually 51cm and this is mainly for catch and release competitions. 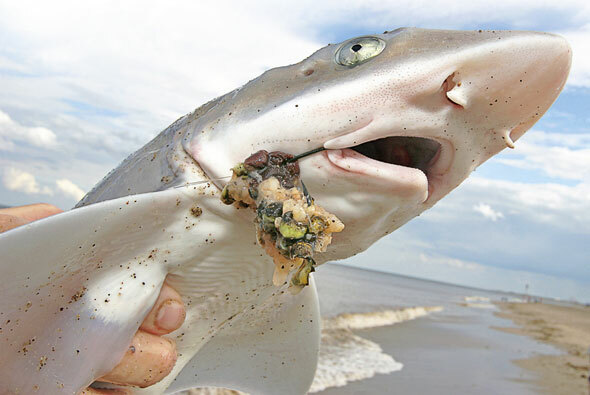 Smoothhounds get caught on a multitude of baits with squid, ragworms, lugworms, sandeels and mackerel among the most successful, but the one bait that tops them all is a peeler crab. Hounds do take hard crabs, but I assure you that peeler is far more deadly. Any type of peeler crab will catch them – common shore crabs, velvet swimmers, edibles or spiders – while afloat, hermit crabs are claimed to be the killer bait. This is probably because they are easy to collect and keep. Hounds move inshore to feed on peeling crabs and it’s a fact that each different crab’s peeling season is targeted around different parts of the coast. Maybe the most sought-after (as they peel for most of the summer) are common shore crabs, but small hard crabs are also an easy mouthful. The biggest crabs that peel en masse, like the spiders, are more localised and peak for a short period, attracting fish over a matter of weeks. Remember, crabs are nearly always the food the hounds are looking for. A peeler crab needs to be tied on the hook neatly because it’s a large lumpy bait that can easily slip down the hook shank and hang around the bend, which then masks the point. Some anglers do not bother fully removing the shell because hounds are not that fussy. However, some superb bites are missed because baits move and the shell shields the hook point. So peel your crab completely, part cut it in half, open it out and lay it along the hook shank before binding securely with light elastic bait cotton so that the bait cannot move during even the most powerful cast. Peel a couple of claws and legs and add to the hook point if you are worried about the fish spotting the cold steel, although hounds aren’t delicate feeders and ask no questions! 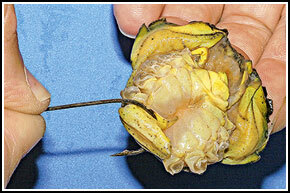 Peel crab, cut it halfway along body, insert hook at bottom and lay shank along the crab. With the hook shank resting in the cut crab, make sure the hook point is exposed. 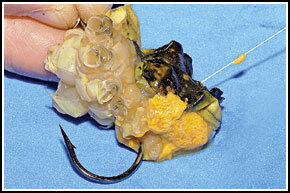 The next step requires baiting elastic to secure the bait on the hook. Hold the hook at the eye and begin to wrap a few turns of cotton around the crab. 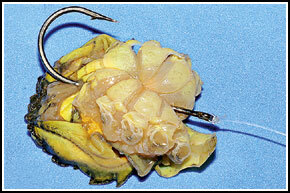 The cotton folds the crab around the shank, but make sure you don't mummify the bait. The finished bait, but you can add a couple of claws and legs to the hook point. In the last issue we featured the pulley rig, which we said is great for catching rays. It is also the frontrunner for the smoothhound, especially over very rough ground where it has no equal. The one-hook clipped paternoster with a long snood is also widely used, and is all you need from many of the mixed or relatively clean sea beds that smoothhounds favour. The simple single hook paternoster is constructed with mono line with a 60lb-plus breaking strain body and 30lb hook snood. The hook snood is tied to a swivel trapped on the main bodyline of the rig by beads and crimps, stop knots or rubber rig stops. Best dimensions are a 6ft body length and 3ft hook snood. This prevents the hook snood wrapping and catching on the top connection clip. 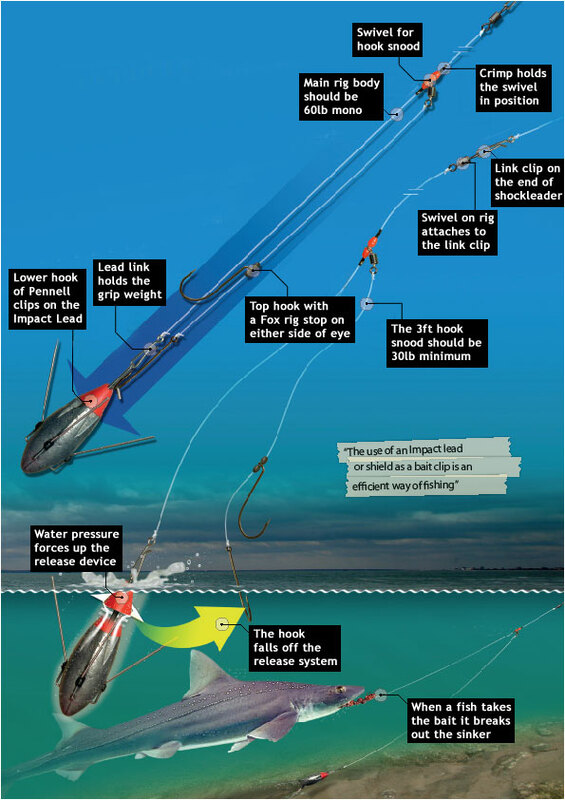 The use of an Impact lead or an Impact shield as a bait clip is an efficient way of fishing. Smoothhounds have rough skin and this can abrade light mono, so hook snoods should be a minimum of 30lb. In many regions spider crabs are also hard on the hook snoods and some anglers prefer heavier mono, say 60lb, or braid hook snoods.